I was tootling away on the net, as you do, when I spotted a tweet announcing that that the Irish Web Awards shortlist was up. And guess what? www.nathalie.ie is on the shortlist for Most Beautiful Website in Ireland! To say I was delira and excira would be an understatement. To stay I was really, really, really surprised would be about accurate. Many thanks are due to Showit, the software I used to create the website, and to Gav Reilly, webby maestro extraordinaire. Without his help, I doubt the site would ever have seen the light of day as I hadn’t a clue how to get it from my computer on to the world wide web. He also designed this blog and the splash page – and didn’t he do a deadly job? Thanks too to Ethan, my mini muse, whose cuteness no doubt helped beautify things. And, as always, thanks to Eoghan for, well, pretty much everything. But mainly for tea. And everything. 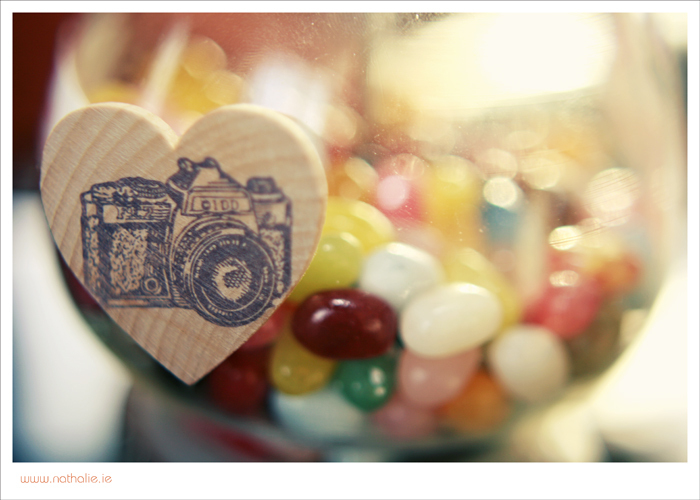 And seeing as I rarely publish a post without a pic, how about a shot of a camera badge and some jelly beans? You know, just because. CONGRATS NATHALIE!! WELL DONE! LOVING THE SITE. I heart that camera badge! WANTSIES!!!!!!!!!!!!! @Ciara Aww, shucks, thanks! Must add those shots of you and your beau to my gallery of beautiful pics!